Kurt Sercu's site is the most comprehensive gathering of information, facts, and trivia about Ellery Queen to be found on the internet. And his research sheds new light into some questions that have puzzled fans for years. You will learn about EQ comics, games, and even jigsaw puzzles. Plus he has episode logs for the many radio and television versions of Ellery Queen. Everything you ever wanted to know about the EQ universe. Mr Sercu's collection of book cover scans is the most comprehensive we have seen, and we thank him for allowing us to borrow some of them to spice up our own listings. Lora Ruffner's elegant website was devoted to the Jim Hutton series and loaded with screenshots, articles, background, and plenty of love for the best filmed representation ever of Ellery Queen. Off-line for years some of the content has reappeared in a simple one-page format, but there is much that is not included. An archived version of the original site is considerably more extensive but often sluggish. 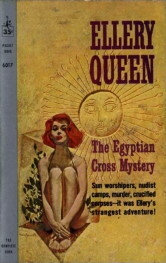 Michael E Grost's exhaustive online survey of mystery fiction includes a lengthy section dedicated to Ellery Queen. Grost has an encyclopedic knowledge of the genre, and his analysis of the Queen stories, the traditions they draw on, and their impact on other writers, is carefully thought out and invariably fascinating. Frank Daniels has assembled quite a bit of EQ-related information, with an especially detailed examination of the Ellery Queen comics. Navigation is a bit inelegant, but the content is worthwhile (as in his explication of the Barnaby Ross historical paperbacks). This is a 1988 thesis by Cathy Akers-Jordan of the University of Michigan (Flint). Her extensive analysis of the themes and techniques that reappear through the EQ works is astute. Some of these discussions include spoilers that should be avoided if necessary. There are a few minor factual errors (e.g. claiming none of the Columbia films was based on an EQ novel). Francis M Nevins is the foremost scholarly writer on Ellery Queen, and this revised, extended, and updated rewrite of Royal Bloodline is an essential for any EQ fan. Everything that made the earlier book required reading is retained, along with tons of new information and insights. He even takes a closer look at the paperback originals. Our opinions coincide on some titles, but on others they definitely do not. His informed, well-reasoned critiques lend spice to this ultimate encyclopedia of Ellery Queen. Highest recommendation. This Edgar award winning study of the Queen books and the authors who wrote them stands as an important documentation, though it has been surpassed by Nevins’s Art of Detection. The book is full of spoilers; you may want to put it aside until you have savored the complete Queen canon. Our thanks to Professor Nevins for his assistance in EQ research. Mr Nevins has produced a new edition of this fundamental reference. Everything about the radio work of Dannay and Lee, including a detailed history of the EQ series, comments from the authors themselves as well as cast members, and a complete episode log. Another essential. Also see this blog post from Mr Nevins about the scripting of the EQ radio shows. Jon Tuska, who wrote The Detective in Film, produced this revised and expanded edition in 1988. It's a must-read for anyone with a fondness for classic mystery movies, while the section on Ellery Queen has fascinating details about how Hollywood treated Dannay and Lee's immortal creation. Here, culled from the Dannay archives by author and dramatist Joseph Goodrich, is the selected correspondence of the two volatile men behind the EQ name, during a period of their most important creative achievements. We haven’t read it but if the subject matter interests you it comes highly recommended. Rose Koppel was a recent widow when she met Frederic Dannay at a New Year's Eve party in 1974. She found him unimpressive, needy and almost silent. But something suggested he might have things to say. Only months later, in the midst of Dannay's courtship, did she learn that what he had to say had been read by millions and that he was world famous as mystery writer Ellery Queen. Says Queen scholar Francis M. Nevins in his introduction: ‘It is not too much to say that Rose saved Fred's life,’ as she enabled him to enjoy the status of mystery elder statesman earned by more than forty years of shaping stories that broadened the reach of mystery fiction. Here is Rose Koppel Dannay's memoir of her years with Fred Dannay, a man almost as difficult as he was brilliant. It is every bit a love story. Even though Dannay and Lee are no longer with us, the magazine lives on. Fine short story mystery fiction, and occasional articles and pastiches about Ellery Queen. The ultimate resource on Ellery Queen is…Ellery Queen. A few of the books are in print in the USA, but most are not. Still, if you have a Kindle, smartphone, iPad or other tablet, what appears to be the entire EQ oeuvre is available for downloading. You can even find curiosities, from The Misadventures of Sherlock Holmes, a compendium edited by EQ only to be banned by the Conan Doyle estate, to a collection of EQ comic strips from Crackajack Funnies. Check iBooks (iOS) and Amazon (Kindle) for your favorite titles. We’d like nothing better than to hear from you. Use the 'contact' link at the bottom of each page.